Zombies are unique in the monster pantheon. Not only do they represent the monstrous other, but they also represent the monstrous self; they are a reflection of us—modern selves. That the zombie is a reflections of modern man is apparent in Romero’s second installment of his zombie narratives, Dawn of the Dead, where he “offers us a glimpse of a universe in which all spiritual values have been replaced by our awareness of the material realities of the corporeal and consumerism” (Russel 94-95). In the beginning of Dawn of the Dead, heavily armed police are unable to evacuate residents and remove zombies from an apartment complex. It is clear that government authority is breaking down along with all other social institutions. In the face of complete social breakdown, the would-be-survivors seek solace in the modern spiritual temple—the shopping mall. They find the mall occupied by animated corpses, the ultimate consumers, wandering aimlessly from shop to shop, apparently as unaware of each other as the crowds of shoppers on a normal day. One puzzled survivor asks, “What are they doing? Where are they going?” These questions underscore the otherness of the zombies, but the reply from another survivor shatters the barrier between the self and the other: “They’re us” (Dawn). The undead are just doing what they used to do. Romero is explicit; consumer culture is a culture of zombies. So strong is the consumer impulse in the protagonists that, after clearing the mall of the undead, the survivors attempt to recreate and inhabit a pre-zombie world of consumerism. They take advantage of all the material pleasures that the shopping mall offers. Gradually, the ideal suburban home that they have created—including a TV that stays on, although it broadcasts only static—becomes not just a “safe haven,” but a “gilded cage” (Murphy 88); the material boon “is underwritten by emptiness as they lapse into frustration, bickering, anxiety and dissatisfaction” (Botting 49). After deconstructing all sources of fullness in Night of the Living Dead, in Dawn of the Dead, Romero turns his critical lens on the consumerism on which society relies to cope with the lack of meaning in modern society. The line between zombie and human is blurred as the undead are shown to be caricatures of the living. Zombies are consumers. Actually, that’s pretty much all they are. They are continuously on the move with one motivation–to consume. 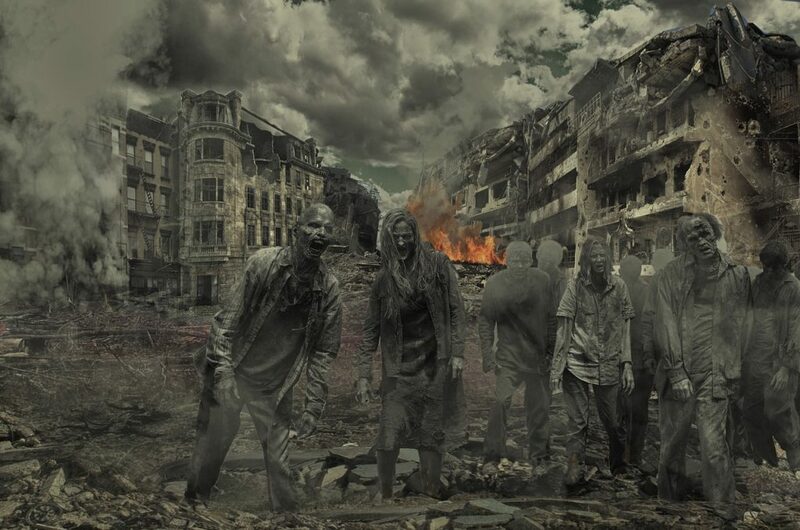 The consumption of living flesh does nothing for the zombie–it gains no nutritive benefit from eating a thigh, it doesn’t extend its life by eating a brain, it doesn’t slow the process of decomposition through the consumption of a liver. It is pure consumption–without purpose. Isn’t this the case for so much of the consumption in the wealthy West? In the absence of the transcendent, we’ve lost all other purposes. What is left? Consumption. Zombies ask us: is that really all you are?